This new show from NBC seems pretty wild. Ricky Gervais caused quite a stir last year at the Golden Globes with his opening monologue (see above) and his smartass comments throughout the show. Nothing was sacred and frankly he was hilarious, even if he managed to piss off a number of guests in the audience. Ricky is back again this year and you can catch the Golden Globes tonight on NBC. If you’re going to watch any award shows this season this is the one to see. Many guests in the audience get drunk so some of the acceptance speeches are hilarious. 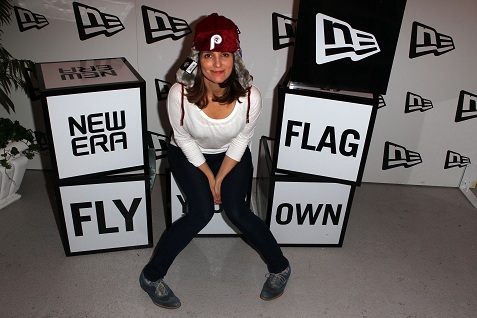 Tina Fey is nominated again, and here’s a pic of her showing off her Phillies New Era Cap at the HBO Luxury Lounge as she gets ready for the show.